Pharmacovigilance is the profession of monitoring medical drug effects after being licensed. This is especially done to identify and examine the previous unfavorable reactions of the medical drugs that has been unannounced. In simple terms it can be said drug safety. The global Pharmacovigilance and drug safety software market is anticipated to be accelerating because of the rising incidences of ADR or adverse drug reaction and surge in adoption of interconnected software services by a number of outsourcing companies. With the increase in demand for various drugs and medications all around the world and continuous efforts to manufacture safe drugs and the increasing pressure on various biotech and Pharma companies, the market is expected to witness a substantial growth in the future years. The top players of global pharmacovigilance and drug safety software market could be more into benefit due to the associated use of cutting-edge softwares like Argus and ARISg. With easy accessible data and reduced use of outdated data, it has become easier for players to adopt pharmacovigilance softwares into the market. The critical use of pharmacovigilance and drug safety for various clinical research is estimated to propel the worldwide market. The rise in patient safety issues and surging occurrences of adverse side effects as a result of certain drug consumption may boost the market for drug safety software and pharmacovigilance in the world. This could also be largely associated with the availability of clinical trial programs and reduction in medical expenditure and thus, propel the overall market for future growth. The global pharmacovigilance and drug safety software market can be categorized on the basis of delivery mode, end user, and software type. Based on classification by software type, the market can be divided into adverse event reporting software, drug safety audits software, issue tracking software, and fully integrated software. The adverse event reporting software segment is seen to be dominating the rest and is expected to continue its dominance in the years to come. On the basis of end user, the global pharmacovigilance and drug safety software market can be divided into pharma and biotech, contract research organizations (CRO), business process outsourcing (BPO) firms. Among these, the segments seen to be dominating the market are the CRO and the BPO firms. They are also anticipated to continue their dominance in the years to come. With respect to delivery mode, the global pharmacovigilance and drug safety software market can be further classified into cloud-based delivery mode and on-premise delivery mode. Geographically, the global pharmacovigilance and drug safety software market is segmented into the regions of Latin America, North America, South America, Asia Pacific, Europe, and Middle East and Africa. Among these six segments, North America is estimated to be holding a substantial portion of the shares with a CAGR of 6.2%. By the end of the forecast period, North American region could show better prospects of growth in terms of revenue shares and drug safety software popularity. Besides, Europe is also anticipated to reach a value of US$9.3 mn by the end of the forecast period followed by Asia Pacific with an exception of Japan. The estimated value of profit earned by Asia Pacific region is to be of value US$8.5 mn. Japan may show a slower growth rate as compare dto other countries of the Asia Pacific region. The total revenue projected is of a valuation of US$13.4 mn by the end of the forecast period. However, Middle East and Africa is envisioned to expand at a slower CAGR as compared to Japan. Prominent players of the global pharmacovigilance and drug safety software market are United BioSource Corporation, Oracle Corporation, AB Cube, Sparta Systems, and UMBRA Global LLC. The global pharmacovigilance and drug safety software market is envisioned to attract benefits while riding on the ability of products to avert, evaluate, and uncover enduring and temporary side effects of certain medications. Pharmacovigilance software could help to inhibit unnecessary future events and determine the cause of withdrawal. These software could be of great use to all those concerned with the medical process, such as drug consumers, prescribers, and manufacturers. Companies are prominently enabled to put into practice proactive safety surveillance programs with the support provided by pharmacovigilance software as they push new limits in the market. 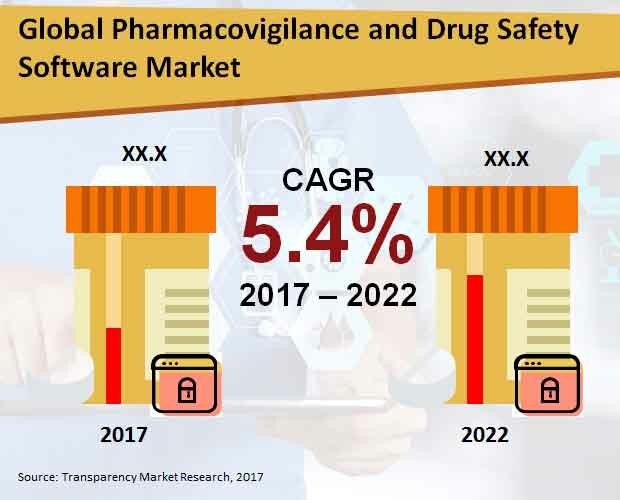 The world pharmacovigilance and drug safety software market is expected to embrace favorable opportunities on the back of government policies related to drug safety regulations and rising rates of cases that pertain to adverse drug reaction. The market could also gain impetus from the surging need for new drug development, considering the high prevalence of chronic ailments and growing geriatric population. Pharmacovigilance software could find an application to minimize the limitations faced by small organizations relating to personnel and financial resources. More prospects are projected to take birth in the world pharmacovigilance and drug safety software market with mounting private and public investments in pharmaceutical research and development activities. The high growth rate of pharmaceutical companies conducting research outsourcing could augur well for the rise in the demand for pharmacovigilance and drug safety software. The international pharmacovigilance and drug safety software market is predicted to be classified into adverse event reporting software, drug safety audits software, issue tracking software, and fully integrated software as per segmentation by type of software. With a 39.7% share achieved in 2017, adverse event reporting software could rake in a greater revenue in the market by the end of 2022. In terms of end user, the international pharmacovigilance and drug safety software market is predicted to be segregated into pharma and biotech companies, contract research organizations (CROs), business process outsourcing (BPO) firms, and other pharmacovigilance service providers. On the basis of delivery mode, there could be prospects birthing in the international pharmacovigilance and drug safety software market from vital segments such as on-premise delivery mode and cloud-based delivery mode. In respect of regional segmentation, the international pharmacovigilance and drug safety software market is anticipated to be divided into Latin America, the Middle East and Africa (MEA), North America, Asia Pacific except Japan (APEJ), and Europe. Among key countries, Japan could expand at a slightly better CAGR of 3.9% than that of the MEA. However, North America is prognosticated to lead the market after earning a US$58.5 mn in 2017. The worldwide pharmacovigilance and drug safety software market is envisaged to witness the presence of significant companies such as UMBRA Global LLC, AB Cube, United BioSource Corporation, Sparta Systems, Inc., Oracle Corporation, EXTEDO GmbH, Ennov Solutions, Inc., and ArisGlobal.